Today, you are a member of... Whew - You Are A Member! 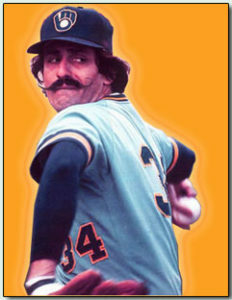 Rollie Fingers, ladies and gentlemen. With style on his face and heat in his game, he’s the man who made modern relief pitching legit. Prior to his arrival at the Major Leagues, relief pitching was a temporary situation, a place to relegate pitchers who might be sucking as starters. Once in the bullpen, said relief pitcher was scarcely seen again since starters had tendency to stay in for the long haul. But when Rollie stepped onto the mound in 1968 he proved you don’t have to be a starter to be an ace. Three-time World Champion with the Oakland A’s, MVP and Cy Young awardee while with the Milwaukee Brewers, and 12-year record holder for annual saves, Rollie worked the role of secondary into that of superstar. This week, whether you are in need of a Rollie Fingers or if you are indeed a Rollie Fingers, remember: closing is king.